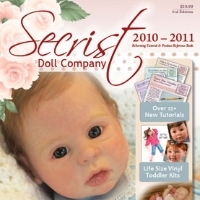 Sign up for coupons, new product arrivals, special offers, and other big news from The Secrist Doll Company. For use with 1/4 length vinyl limbs.The cloth body slips does not include vinyl arms, legs or head. Attach whatever vinyl limbs set that you choose! These body slips are jointed in the elbows and knees. Cable ties are included with each body slip. Many people find vinyl parts from other manufacturers and then use them on our cloth body slip because of our quality and proper body size. All body slips include preinserted cable ties. Stuffing sold separately. To simplify the ordering process for you doll kits and body slips are sold separately. Click here for more information on Secrist Doll Company cloth bodies and limbs. Click here to browse 19" dolls. Click here for extra cable ties. Please select the desired size body slip from the drop down menu and enter the quantity needed in the box. The International Tutorial and Product Guide is the only one of its kind in the entire reborning industry. Find out what tens of thousands of reborners around the world have already discovered - the Secrist Guide is one of the most valuable reborning resources you have! While perfectly safe, these dolls are not manufactured for children. Secrist doll kits and supplies are intended for adults.